ELM CITY, NC - The sunshine that produces juicy muscadine grapes 11 miles southwest of Rocky Mount will now produce enough electricity to power nearly 200 homes and businesses in Nash County. State and local officials, company representatives and neighbors from the Elm City area gathered on Thursday evening, June 21, to commission the 1.5 -megawatt Sandy Cross Solar Farm on an 11 acre site at the Lewis family farm. The Sandy Cross Solar Farm is the most recent project completed by O2 Energies Inc., a Charlotte-area solar-development firm that is building a reputation for marrying sustainable agriculture and sustainable energy production on farms in the southeastern United States. O2 Energies already owns and operates several solar farms across North Carolina and will start construction soon on a solar farm that also will create a new sheep farm in Franklin County. The Sandy Cross Solar farm just across I-95 from Sandy Cross Vineyard, which grows organic muscadine grapes, will produce more than 2,150 megawatt-hours of affordable electricity per year. The electricity will be sold to Progress Energy for distribution to its customers in the area. O2 energies is leasing the property from the Lewis family, whose century farm was split by I-95's construction. "We hope this project sets a standard for the partnership between solar farms and family farms in the state," said Joel Olsen, O2 energies President. Sustainable agriculture and sustainable energy production complement each other, Olsen pointed out. Solar farms have a low profile, they're noiseless and they produce no pollution and consume no water. And it may surprise many people that solar arrays are even more efficient than plant life at converting solar energy. Plants such as grapes and soybean typically use only 3 to 6 percent of the sun's light for photosynthesis. O2 Energies Sandy Cross Solar Farm uses over 6,000 Renewable Energy Corporation Modules which are made with US produced silicon. (REC) Peak Energy modules convert roughly 15 percent of the sunshine to electricity. 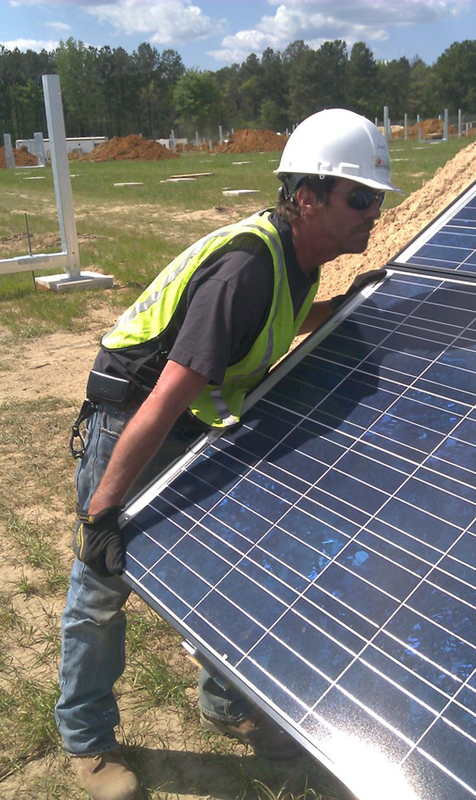 Olsen noted that O2 energies used North Carolina suppliers and local manpower for much of Sandy Cross Solar Farm's construction. Morrisville-based Southern Energy Management-PowerSecure engineered and constructed the solar farm. Daetwyler Clean Energy of Huntersville supplied the mounting and racking structure for the fixed-tilt array. Among the approximately 80 workers who built the plant, half are from Nash County and most of the others are from neighboring counties. Olsen said that although this was the first time that many of them worked on a solar farm's construction, he expects a good number will continue in the solar-power field by working on other O2 energies projects. Thursday's commissioning event included representatives from the N.C. Department of Agriculture who brought along their "Got to be NC" giant shopping cart and touring RV. Also represented were officials from the N.C. Agriculture Finance Authority that worked with Blue Harbor Bank to provide financing for the $5-million project. In addition, there was a local sheep farmer showing off some of his animals that will maintain the solar farm's grounds by eating grass and weeds. The event ended with a wine and juice tasting provided by Old North State Winery of Mt. Airy, which uses Sandy Cross Vineyards grapes in some of its products, while music with a "sun" theme played in the background. "We are very proud of this project," Olsen said, "and are fortunate to be working with so many committed project partners." Click on the above image to see more pictures from the Sandy Cross Solar Farm! O2 plans $4.5 million solar project in eastern N.C.